We have developed a set of proprietary tools – the MarketGrid Tools – that automatically generate much of the code for MarketGrid systems from a data model that represents the system. Build the Data Model. The first step in building a MarketGrid system, before a line of code is written, is to build the data model. The data model is built in a graphical tool and looks like a traditional relational schema diagram. It will include some meta-data to tell the Tools how the system is to be built. Generate the Base System. 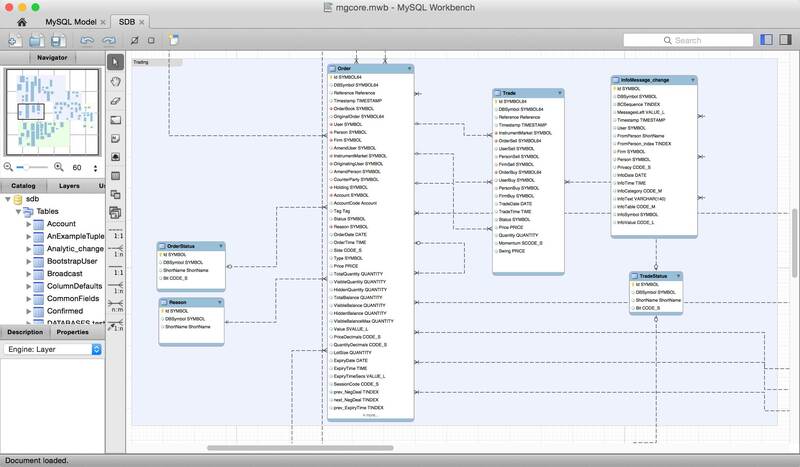 From the data model a single make command generates the entire system. This includes all the code for the matching engine, communications gateways, static database, market database, HTML5-based GUI and MarketGrid API components. Implement new or changed business logic. Once a base system has been generated using the MarketGrid Tools, all that remains is to implement any new or changed business logic for the particular implementation. There is no need to write or change any infrastructure-related code. The system is self-adapting to change making it flexible, cost-effective and future-proof. The MarketGrid Tools comprise about 10,000 lines of highly optimised and stable code. Using the MarketGrid Tools, there are a number of steps to create a customised implementation of MarketGrid (or to modify an existing implementation).